Hebron's Family Farm: ......and away we go. My intention was to start this daily journal of life and happenings that went on at the farm. Well no one ever said I was on time. The picture in the header is of my youngest daughter Jorja May the day I started to create this blog. She was about one and a half years old, she will be 4 in January. So from the time I created the header till I put up my first post ..... yep that's right about two and a half years. I promise my next post won't take that long. I guess my biggest fear was where do I begin. Some of you may already know about us and what we do and others will stumble across this and see a glimpse of my family. So lets set fears aside and just jump right in. Along the way I'll try to fill in as many blanks as possible. Green thumb, you bet. Dirt under my fingernails, to often. But I think the thing that makes me a farmer more than anything is my blood. It flows in my veins. I've inherited it from my ancestors and didn't even notice. It started to emerge once I got a place of my own. The first year I turned our urban backyard into a vegetable farm. My wife Michelle thought I had lost my FU*#@^^ mind. Then came the baby goat, then the back yard chickens. A few bottle fed lambs and spending a lot more time at my fathers farm. Add a few years, a few tears (mainly Michelle's, God bless her) and we are now making our living doing something my grandfathers did. I'm going to try and use this blog as a way to inform, enlighten and possibly educate. So feel free to ask any question you may have and I'll give it my best shot. Maybe we can all get a good laugh every now and then. Let's set the scene at the farm today, COLD. Get the chores done fast and make the animals as comfortable as possible. Dad (Tony, Grandpa T or just "T") and I are becoming pretty efficient at getting the daily chores done fast. But, and there is always a but, something always causes a quick change of plans. Today it was just a simple frozen hose that didn't get drained correctly the day before. This not being the first time, was fixed by going down the road to the heated shop and grab the spare. hopefully he took the frozen one with him to thaw out. 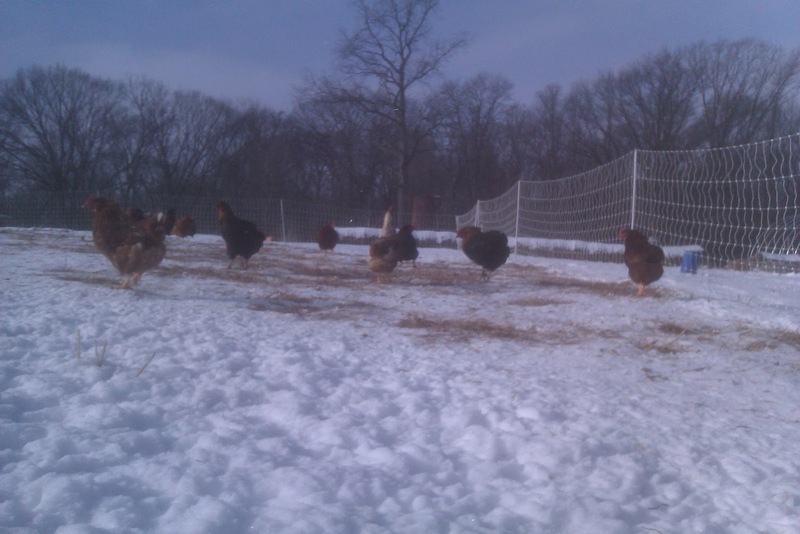 Right now chores consist of feeding and collecting eggs from the chickens in the morning. Evening chores we do that again and also feed, bed and water the hogs, hay the sheep and make a plan for the next day. Which at this point in time starts pretty darn early. especially for a Sunday the week before Christmas. Richard and Annette made a trip to the butcher today to pick up the beef from the steers that went to camp two weeks ago. The freezer should be full of beef for a while or at least a week or two. I'll try and give everyone a picture of the day. These ladies are out looking for something, anything to peck at. 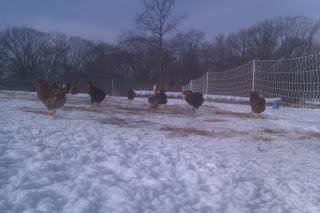 They have cleared away about three inches of snow in search of some grass.They are a part of our young layer flock. They were hatched a little later in the year than what we usually do. Thus they are just now starting to lay eggs. I'll try and give everyone a daily egg count from this flock as they are the ones I collect. There are over three hundred pullets out here and today's count was 33 eggs. This is great Chris. Thanks for keeping the blog. What types of chickens do you guys have? Hope your family had a wonderful Christmas! Thank you for the nice comments. @Nicola our layers are Red Stars Barred Rocks and Black Australorp's with a few variety scattered in. The meat birds are a white mountain Cornish Cross. Christmas was great...now on to the New Year!